The high performance version of the Car of the Year 2009 will be unveiled on May 7, when the Opel Insignia OPC premieres at the Barcelona Motor Show, ten years after the launch of the first OPC model (Opel Performance Center). The heart of the Insignia OPC is its 2.8 V6 Turbo engine. Derived from the powerful gasoline engine already available on the top-of-the-line Insignia, this version reaches an output of 239 kW/325 hp. The increase in power was obtained by a special engine development and by reworking the exhaust, significantly reducing the counter pressure. The high performance version of the Car of the Year 2009 will be unveiled on May 7, when the Opel Insignia OPC premieres at the Barcelona Motor Show, ten years after the launch of the first OPC model ( Opel Performance Center ). 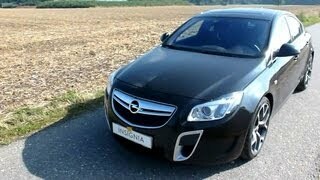 The heart of the Insignia OPC is its 2.8 V6 Turbo engine. Derived from the powerful gasoline engine already available on the top-of-the-line Insignia, this version reaches an output of 239 kW/325 hp. The increase in power was obtained by a special engine development and by reworking the exhaust, significantly reducing the counter pressure. And because sound is so important in the appreciation of an engine, the acoustic specialists worked on the exhaust of the V6 by adopting specific center and rear mufflers. 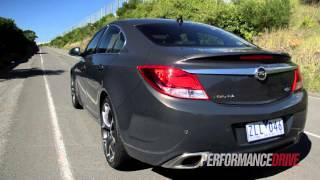 The Insignia OPC is available with a six-speed manual gearbox. The strong torque of 400 Nm ensures abundant pulling power even at lower engine speeds. With this engine performance, the Insignia OPC reaches a top speed of 250 km/h (restricted) and sprints from 0 to 100 km/h in six seconds. The already very well performing Insignia chassis was further fine tuned for the OPC variant which ride height has been reduced by 10 mm compared to the Insignia (AWD Sport version). The newly developed mechatronic chassis also receives a new front axle. The front suspension architecture of the Insignia OPC retains a so called McPherson strut, however the engineers at the Opel Performance Center came up with an evolution called HiPerStrut (for high performance strut). Benefits are an improved steering feel, reduced steering disturbances due to the high torque and an enhanced feeling in the handling for the driver. The Insignia OPC also comes with the adaptive FlexRide suspension which not only adapts to driving situation and driving style but also to the driver's preferences. While on the Insignia the system offers the choice between a standard adaptive setting, a more comfortable mode and a sport mode, the OPC is definitely addressing those enjoying a sportier ride. OPC drivers can choose between three different sport modes: the standard mode as the high comfort setting, a special Sport mode and the OPC mode, for optimal performance. For the first time also in the OPC portfolio, the Adaptive 4x4 system and its electronic rear limited slip differential (eLSD) are standard. The four-wheel drive management unit has been recalibrated to adapt torque distribution to the sporty philosophy of the OPC. Taking the higher performances of the OPC into consideration, significant development efforts were put into further improving the brake system. Connoisseurs will immediately spot the Brembo calipers and the perforated 355 mm disc on the front axle. 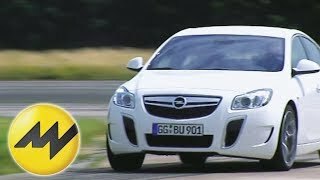 �I was personally involved in the development of the Insignia OPC and I very much enjoyed extensive testing on the most demanding race track of the world, the Nürburgring Nordschleife. Our target was to rival the �best of the best�,� said Hans Demant, Managing Director Adam Opel GmbH. The top-of-the-line body style dressed in an elegant sports outfit is inspired by the GTC concept car which starred in 2007, but still remains true to the Insignia's design philosophy of sculptural artistry meets German precision. Compared to less powerful versions of the Insignia, the OPC shows a spectacular new front end with two large vertical intakes and a specific rear bumper with dual integrated exhausts. The 19-inch wheels (tires: 245/40) are standard and give the car the stance it deserves. New 20-inch lightweight forged wheels (with 255/35 tires) are available as an option. The dynamic sportiness of the exterior is also mirrored in the cockpit. When opening the door, the OPC is immediately impressive, from unique Recaro seats to a flat-bottomed sporty steering wheel and specific gear knob. The OPC also presents distinctive instrument graphics. �The Insignia OPC marks the beginning of a new era for our OPC portfolio; still bold, but also more mature and refined, and more ambitious than ever. The OPC epitomizes the Insignia experience: dynamic and refined�, says Alain Visser, GM Europe Vice President Opel.